Christos Tapoutos and Dimitris Kalaitzidis are the newest acquisitions of PAOK Thessaloniki. Both players signed a one-year deal. 27-year old Tapoutos stands 203cm and plays as a small forward. The Last three seasons he has been wearing the jersey of AEK. Dimitris Kalaitzidis is 24 years old and 194cm tall, and plays as a point guard. He spent the last two seasons with Panellinios, while he has also played for Iraklis, Olympiacos and Olympiada Patra. 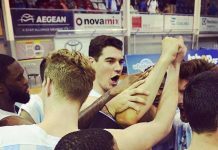 Alba Berlin sends the series to 5th game!